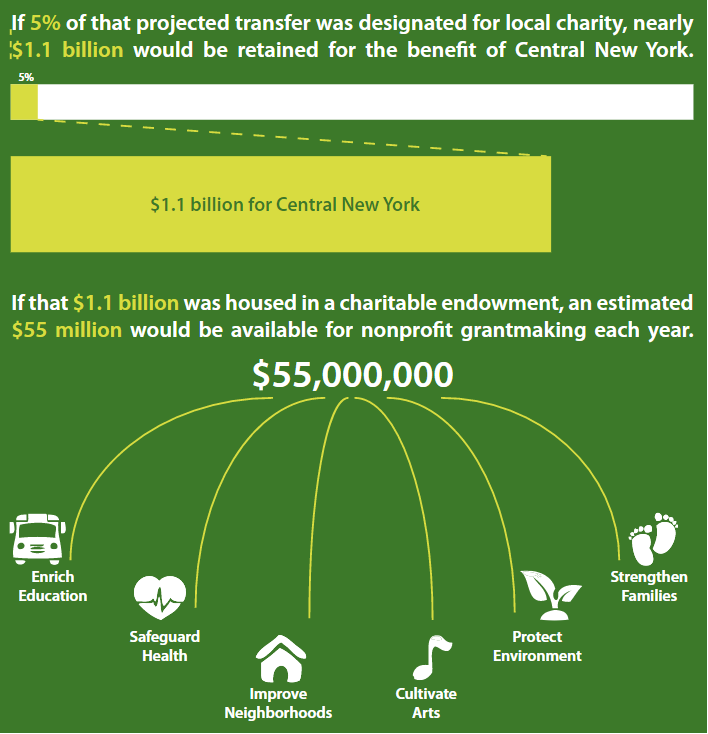 People could help Syracuse and CNY thrive if they named a portion of estates to local non-profits and philanthropies. $20 Billion of wealth is expected to be transferred in the region over the next decade, even a small portion of which could help arts, human services, environment and other organizations. As people think about holiday giving…they might want to think about the legacy they can create long-term. Central New York’s Baby Boomers will be leaving behind billions of dollars over the next decade, according to a study of local personal worth. Even a small percentage of that wealth, if bequeathed to charities and other non-profits, could make a big difference in the community. Linda Dickerson Hartsock has spent a lot of time thinking about – and working for – a better community. She’s had jobs in community development in the Hudson Valley…and has worked here in Syracuse and at her home in Homer on revitalization, helping youth and improving things. When the baby boomer hit a milestone birthday, it caused her to think about it a bit further. Linda Dickerson Hartsock with her son. Hartsock decided to set up a fund to have some of her estate, once she passes on, go for things she believed in and worked toward. Part of the process of setting up the fund at the Central New York Community Foundation was writing a letter: what’s important to her…and what might happen with what she’s leaving behind. We’ll get back to Linda’s story in a minute. Community foundation Executive Director Peter Dunn says there’s a lot of wealth in the personal estates and accounts of people here in CNY. How much? A 2011 study by the Center for Rural Entrepreneurship found total net worth of people in our five-county region totaled 57 (B) billion dollars. Tymeik Johnson has been coming to the Boys and Girls Club of Syracuse for years…does homework, gets some recreation…and some opportunities he might not otherwise. Tymeik’s a fifth grader…India Jackson is a seventh grader who comes after school. 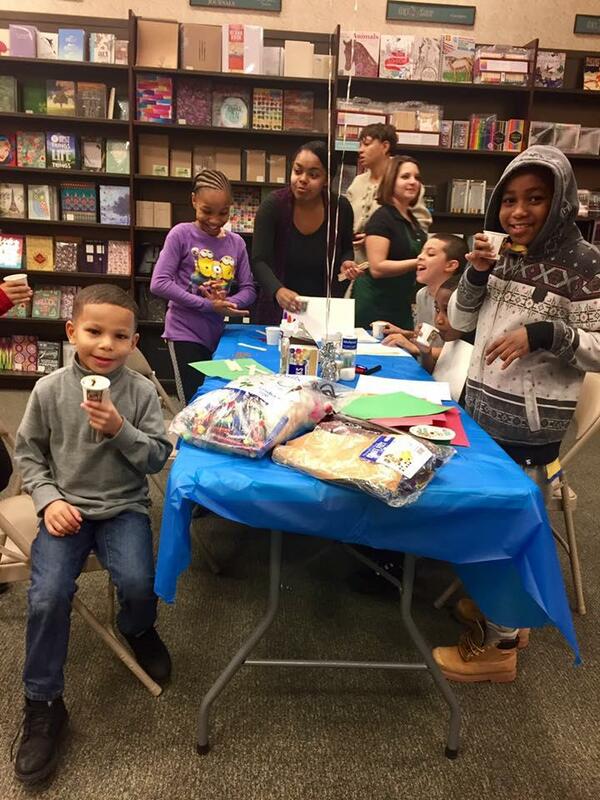 Boys and Gils Club Syracuse members and staff at a recent fundraiser at Barnes and Noble. Smart Girls and Passport to Manhood are for leadership and self-confidence; a STEM program and Career Prep help with learning and build job skills. Boys and Girls Club Development Director Jennifer Jock says the programs are valuable for a number of reasons. Collaborations with the food bank and other partners help…but Jock says individual and foundation donors are also essential. When people think about what to do in charitable giving or estate planning they might see an attorney like Ann Ruffer, a partner at MacKenzie Hughes Law firm in Trusts and Estates. Of course they might have an affinity for a charitable organization with which they were involved…a college or medical institution, a religious group or one that helps animals or children. But Ruffer finds not everyone thinks of their community. 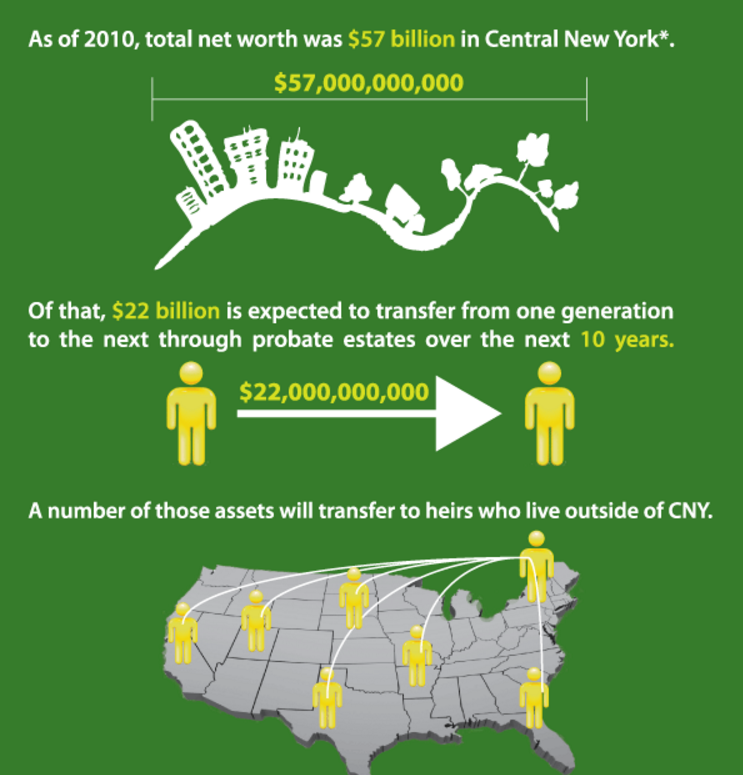 CNY wealth study shows the amount of money leaving the community if people bequeath it to heirs who live outside the region. Don’t even mention that to the Community Foundation’s Peter Dunn. Their 5 for C-N-Y campaign is trying to get five percent of people’s estates left to organizations within this community. ANd you want to hear the astounding impact that can have? Remember that amount from before…20 billion dollrs of wealth being transferred over the next decade or so? Well 5 percent of that is about one billion dollars that Dunn says could be game changing ? A small percentage of people's estate value could have a big impact on just how thriving certain community and cultural resources are int eh community. We heard about the Boys and Girls Club…Another example of where that money could go is “Say Yes to Education.” What’s now a 30 million dollar endowment for Say Yes, Dunn says, is immensely valuable. 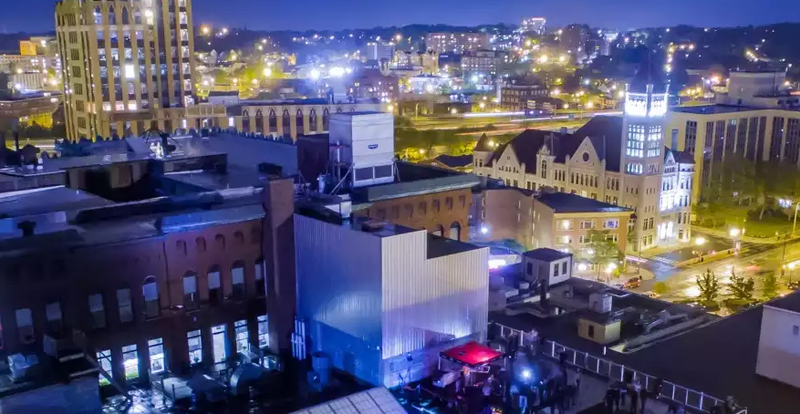 Or how about a more thriving arts scene…Dunn says most local cultural institutions don’t have much in the way of endowments, which could be developed with more assets. He adds the same impact might be seen in poverty, animal welfare and other areas. You might be thinking ‘that money we’re trying to spend on the community really belongs to the children or other heirs’ – well, you’re right. And estate attorney Ann Ruffer says, mix money and family? Well…? But it doesn’t have to be. Certainly advanced planning … and advanced warning can help. Remember Linda Hartsock? …she had the same worry when she told her children that some of their inheritance was being pledged for community causes…but she got a surprise. Of course, She reminded them only five percent was pledged for a fund – in fact, one son wondered why not more? That certainly went better than many might expect…and Hartsock understands why it hasn’t come up in many families. Who’s probably thinking community when considering how to bequeath their assets? Well, Peter Dunn finds folks who don’t have children are most likely to leave money to community organizations directly or through a foundation. Full disclosure, WAER does get support from the Central New York Community Foundation at times…including their Five-for-C-N-Y program. But everyone we spoke with for this story is concerned that in financial planning people might not think of the local charities and causes important to them. And virtually every charitable, educational, religious, cultural, environmental and service organization can appreciate how much it might help.